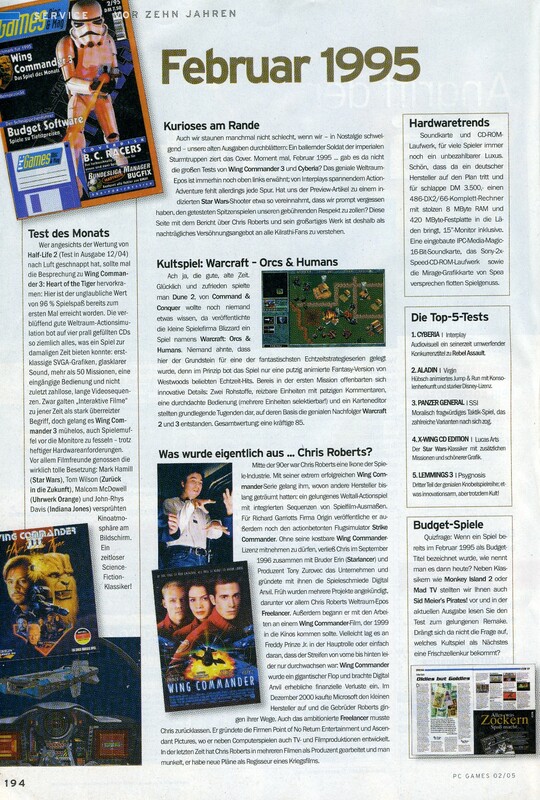 Tolwyn sent us this article from the January 2005 edition of the German magazine PC Games. There are two columns of interest to WC fans. The first notes that Wing Commander III was the first game reviewed by the magazine to receive a score of 96%, a score only recently matched by Half Life 2. The second column details what Chris Roberts has been up to since leaving Origin. The WC movie of course gets covered, and the magazine comments that Freddie Prinze Jr. may be responsible for the movie not being as successful as it should have been. What became actually of… Chris Roberts? In the mid 90’s Chris Roberts was an icon of the gaming-industry. With his extremely successful Wing Commander-series he reached of what other producers only dreamt so far: an excellent space-action-game with integrated sequences with movie-dimensions. For Richard Garriott's company Origin he also published the action-based flight-simulator Flight (Strike) Commander. Without being able to take his valuable Wing-Commander licenses with him, Chris left the company in September 1996 together with his brother Erin (Starlancer) and producer Tony Zurovec and founded together with them the game-forge Digital Anvil. Early several projects were announced, including Chris Roberts’ space-epic Freelancer. Besides he began with the work on a Wing Commander movie, which had to come to cinemas in 1999. Maybe it was because of Freddy Prince Jr. in the leading role or only because the movie was mixed from the beginning to the end: Wing Commander was a giant flop and brought financial losses to Digital Anvil. In December 2000 Microsoft bought the small producer and the Roberts brothers went their ways. Chris also left the ambitious Freelancer behind. He founded the companies Point of No Return Entertainment and Ascendant Pictures where he works next to Computer-games on TV- and movie productions. In the last time Chris Roberts worked as producer for several movies and there are rumours that he has plans as director for a war-movie." Those who had to catch their breath concerning the rating of Half-Life 2 (reviewed in issue 12/04) should have a look back to the review of Wing Commander 3: Heart of the Tiger. Here the rating of 96% gaming-fun was reached for the first time. The amazingly good space-action-simulator had everything on four full CDs that a game in that time could have had: first-class SVGA-graphics, glass-clear sound, more than 50 missions, an easy to learn handling and last but not least, plenty of long video-sequences. In that time "interactive movies" was a strongly overwrought term, but Wing Commander was able to tie people to the monitor who actually didn't like computer-games - even with the high hardware-requirements. Mostly movie-fans enjoyed the fine cast: Mark Hamill (Star Wars), Tom Wilson (Back to the Future), Malcolm McDowell (clockwork orange) and Kohn-Rhys Davies (Indiana Jones) sprew cinema-atmospehre on the screen. A timeless Science-Fiction-classic!"